hi. i am switching (maybe) from netbeans to phpstorm. one of the things i really love is the sftp integration of netbeans. finally i figured out how to setup the remote connection. now i can rightclick on a file and will find an upload link. but.. is there any download link? synchronize won't download a testfile. If I'm correct, you are using wrong "Synchronize" button. The one you most likely referring to just re-reads local file system and not sync with deployed version. The correct "Synchronize" button (as well as "Download" and others) is located under "Deployment" submenu. sure. see screen attached. 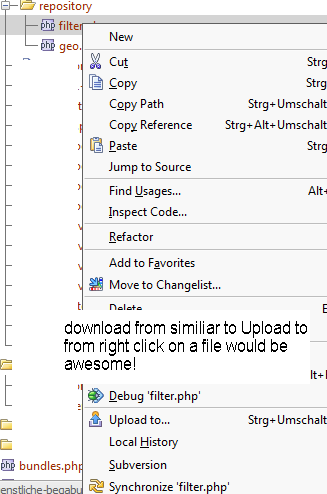 basically i am missing a 'download from' menu entry when right clicking on a file. like the 'upload to' .